.35MM NOZZLE VS. .50MM. WHAT IS THE DIFFERENCE? “Which nozzle is best? .35mm or .50mm?”. This is one of the most common questions that prospective customers have when researching their 3D printer options. 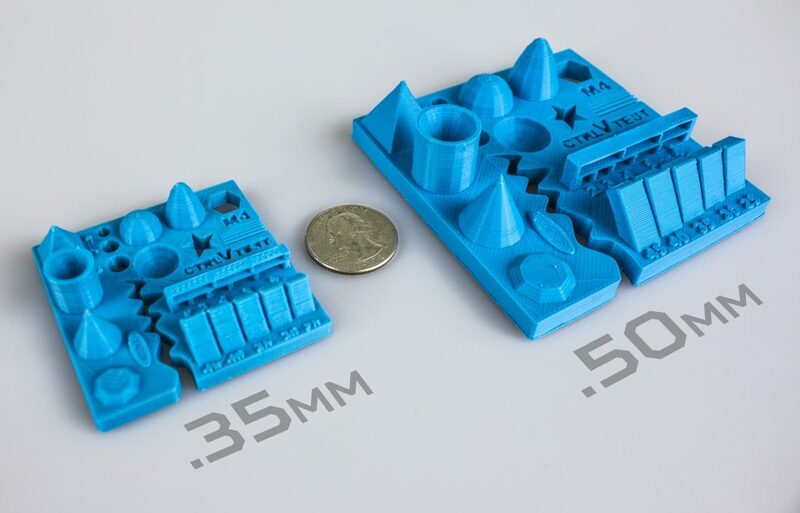 Airwolf 3D offers customers the option of purchasing .35mm nozzles but it is not always clear why they might actually prefer the .50mm nozzle over the .35mm nozzle. Simple logic would suggest that the .35mm nozzle is thinner so it should provide the best prints, right? Well…Yes and no. Let’s start with the drawbacks of the .35mm nozzle. The .35mm nozzle reduces the print speed for a number of reasons. The most obvious reason is that the .35mm nozzle is a smaller diameter and it takes more time to fill the same amount of space. In most cases the .35 nozzle is tantamount to using fine-tipped markers to color a, “Welcome Home” banner. It can be done. It’s just going to take a really long time! Second, several settings have to be changed when printing with the .35mm nozzle because the smaller aperture creates more internal pressure inside the nozzle. Trying to print with faster settings will increase the chances of ruining a print job or a damaging the print head…or both. The aperture on the .35 nozzle is so fine that some 3D filaments do not print well with it, if at all. Filaments that are either abrasive, or that contain exotic materials like wood fibers, for example, are more prone to clogging the nozzle. The main reason is that the solids that are suspended in the resin are either too large for the aperture, or that too many of the solids try to squeeze out of the ejection port at the same time and become lodged. In order to safely print with .35mm nozzles the user will often need to increase the operating temperature of the print head. 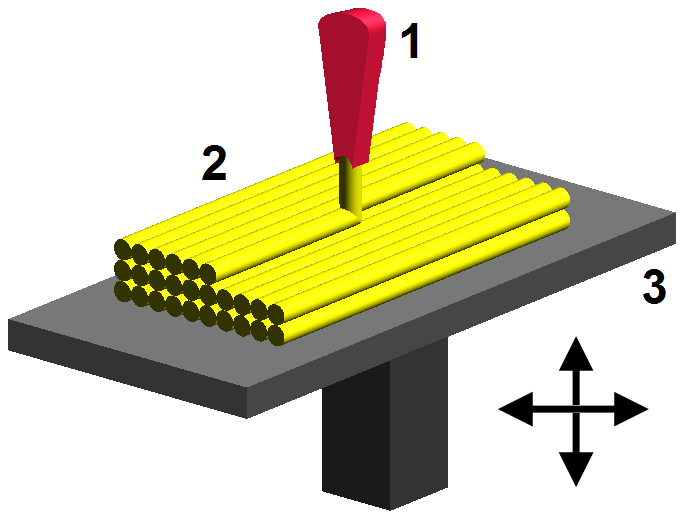 Doing so usually increases the viscosity of the filament which makes it flow more freely through the tiny aperture. Failing to take temperature into account can increase the back pressure on the print head and lead to some of the mechanical failures discussed below. When using the .35mm nozzle the user may have to increase his/her layer heights to approximately 100+ microns. This further helps to alleviate the back pressure that is placed on the print head when using the smaller nozzle. Increasing the layer height is similar to releasing thumb pressure on a garden hose when using it to create a jet of water. The increased distance from the nozzle to the print object allows molten plastic to flow more freely from the print head. The .35 nozzle increases the chances of sputtering or clogging at the print head. Sputtering happens when the nozzle is only momentarily blocked and enough pressure builds up behind it to pop and erupt molten plastic like a mini volcano. Even if it doesn’t clog the nozzle, this can still ruin a print. Clogging is even worse because it means that the nozzle is completely obstructed while it is trying to print. The printer will keep going through its motions as though it is extruding filament, but nothing will come out. This eventually leads to the phenomenon called, “mouse bite” discussed below. The .35mm nozzle also increases the chance of so called, “Mouse Bite”. This occurs when the nozzle becomes clogged and the filament has nowhere to go. The hobbed bolt that feeds the pre-melted filament begins stripping the filament like a screw that is over tightened. This results in a filament that appears to have small bites taken out of it (mouse bite) and can no longer feed. 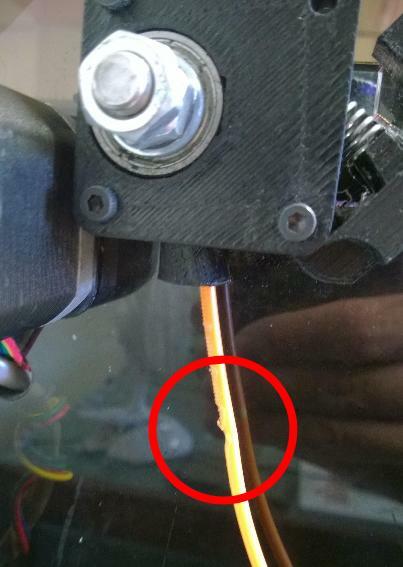 The only solution to this problem is to clear the jam and cut the filament below the site of the mouse bite, which can be extremely time consuming. With all of the drawbacks of using a .35mm nozzle the question remains, “Why would anybody want to use the .35 nozzle?” The short answer is that that there are some cases where the .35 nozzle is actually a necessity. Do not be discouraged from using the .35mm nozzle. It is still possible to successfully print with it, but it will take much more finesse than it would with the .50mm nozzle. This is why Airwolf 3D usually recommends that novice users stick to the .50mm nozzles. For readers who are still interested in the .35mm nozzles here are some of the benefits. 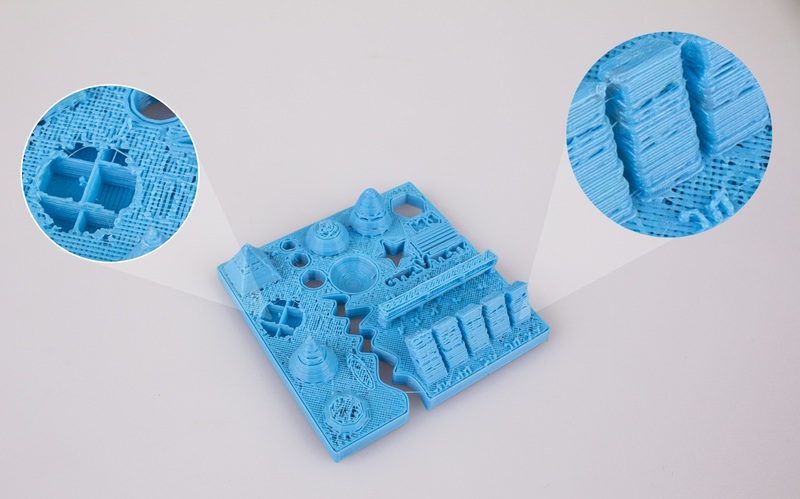 The .35mm nozzle allows users to print thinner details. This is especially handy if the object requires fine detail such as text, narrow cavities, or thin walls. In the picture shown here, the object labeled .35mm would not be able to be accurately printed with the .50mm nozzle. If the user attempted to print the object on the left with a .50mm nozzle many details would be obscured, particularly the letters. For print jobs that require a high degree of fidelity, the .35mm nozzle is a must! appearance of the unfinished prints. The most common methods for removing the striations are by sanding or using a chemical treatment such as acetone vapor. This is fine for big prints such as the coyote shown here, but it may not be feasible for small prints with finer detail. The .35mm nozzle can reduce the visible striations in prints along the X and Y axis; however, the striations along the Z axis may be more pronounced as a greater layer height is usually recommended for use with the .35 nozzle. The diagram below illustrates why this occurs. 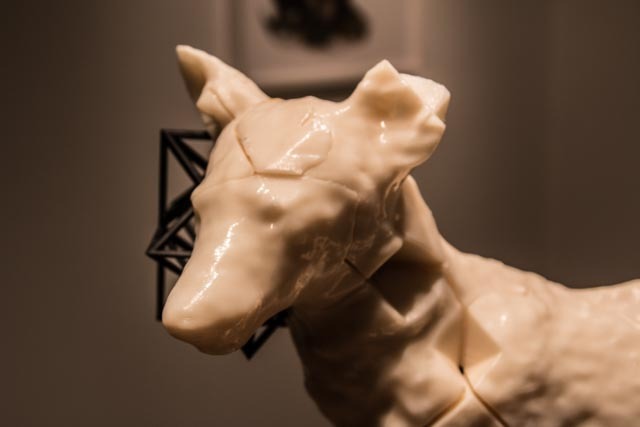 In fused filament fabrication, objects are printed with ribbons of plastic material that become welded together. These individual ribbons are what give FFF models their striated appearance. When using the .35mm nozzle the ribbons can be thinner and clustered more tightly together. SO, WHICH NOZZLE IS BEST, AGAIN? Both nozzles are equally valuable; however, the .50 nozzle is the winner if the user requires trouble free prints that do not contain super fine details. If the user requires fine detail; however, and is an experienced user then the .35 nozzle may be right for them. Generally speaking, the .35 nozzle will produce more refined prints, but at the cost of speed and usability.